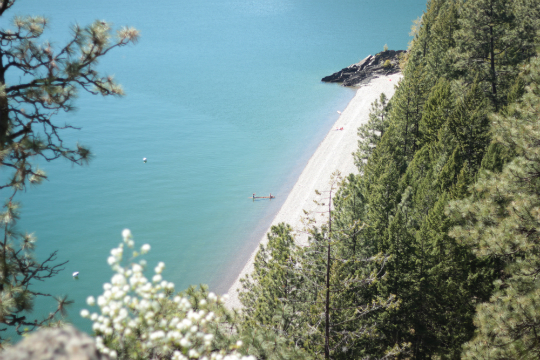 Exploring Lake Pend Oreille on foot from its many access points is one of the finest pleasures the lake offers. Following are some recommended trails. 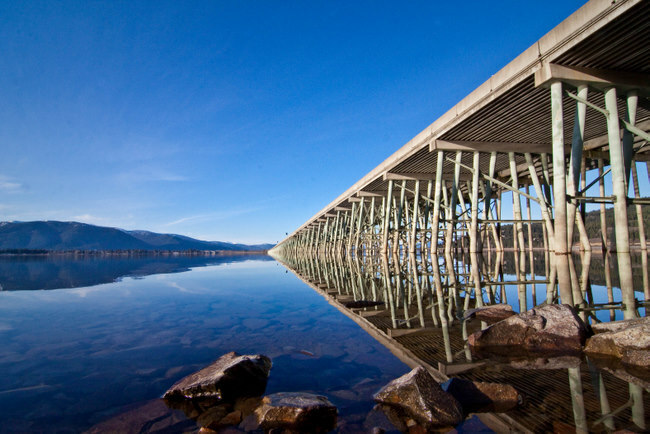 The most popular lake walk from Sandpoint is across the Pedestrian Long Bridge, which starts at the U.S. Highway 95 south entrance to town. It parallels the highway bridge for automobile traffic across the lake. A two-mile trek, it also makes a fine bike ride that may continue down Bottle Bay Road around the south shore of the lake. Connecting downtown Sandpoint to the small community of Dover is the bike path that is part of the Sandpoint-Dover Community Trail. Paved and flat, it’s and pleasant three-mile walk from Sandpoint to Dover that runs parallel to U.S. Highway 2. That trail leads to more than 9 miles of trails, all open to the public, at Dover Bay, along the water and through natural preserves, and to a beautiful new park with panoramic views. The Pend d’Oreille Bay Trail, under development, is a two-mile-long shoreline trail that begins just north of Sandpoint City Beach and extends to Black Rock in Ponderay. To learn more, go to www.pobtrail.org. A fairly new trail that climbs high on a ridge north of Sandpoint, Mickinnick Trail No. 13 provides the most extraordinary views of the Pend Oreille River, Lake Pend Oreille, Sandpoint and the Cabinet Mountains. The 3.5-mile hike is a fairly steep grade all the way to the end, but its proximity to Sandpoint and the terrific views from all along its winding ascent have made it a well-used and popular trail. To find the trailhead, turn off U.S. Highway 95 onto Schweitzer Cutoff Road. Turn right at North Boyer Road and then left onto Schweitzer Mountain Road. Go one-half mile to Woodland Drive. Turn left and go one-half mile to trailhead on right. Gold Hill Trail No. 3 is a classic hike switchbacking up Gold Hill to a pair of benches situated on a rocky knob with unparalleled vistas of Sandpoint and the Pend Oreille River. If you want to make the 3.7-mile climb to the viewpoint, take the lower trailhead found on Bottle Bay Road 4.5 miles from Highway 95. If you want an easy way to the viewpoint, locate the upper trailhead: Turn off Highway 95 onto Sagle Road about six miles south of Sandpoint and go six miles to Contest Mountain Road No. 2642. Follow it approximately six miles to the upper trailhead. Mineral Point Trail No. 82 near Garfield Bay is an easy hike that is highly recommended by the Forest Service and just about anyone who has ever walked it. Taking you along the shore's edge, it leads you two miles from Mineral Point down to Green Bay and affords excellent views of the Green Monarchs. The trail is located off Forest Service Road No. 532 about two miles from Garfield Bay. Another Forest Service trail takes hikers to Maiden Rock, a 2-mile trek down to the gigantic granite formation on the western side of the lake. Part of Maiden Creek Trail No. 321 is quite steep, and it's much more challenging to return back up to the trailhead. To find it, turn off Highway 95 onto the Blacktail Road just south of Cocolalla, then turns left onto Butler Creek Road 230. The trailhead begins at the end of Butler Creek Road, about five miles from the highway. Just south of Maiden Rock, another Forest Service trail leads to another lake landmark, Evan's Landing, a two-mile hike mostly downhill. The trailhead is found by turning at the other end of Blacktail Road, near milepost 457 on U.S. Highway 95. Turn left again at Little Blacktail Road, and then a right on East Ridge Road. Go one-half mile and turn left onto a short spur road to a parking area where the road splits. A beautiful hike or mountain bike ride also includes a beautiful drive along Idaho State Highway 200 to get to the trailhead in Hope. Strong Creek Trail No. 444 climbs steadily through dark timber, some of it old-growth cedar, along the stream to the more-open upper slopes above Hope on its way to Round Top Mountain and Trail 120. 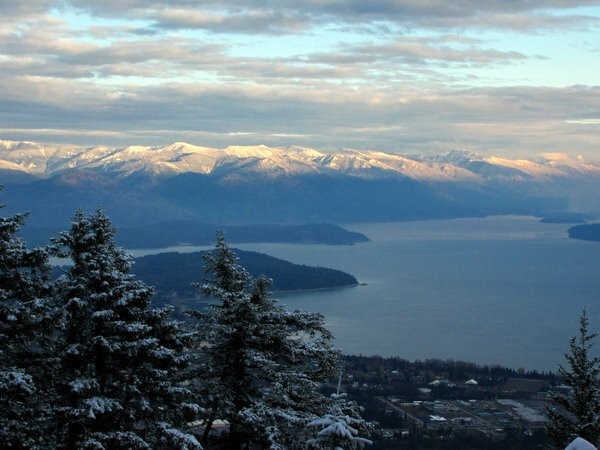 As the 7.3-mile trail nears the top, views improve of Lake Pend Oreille, which stretches out below in its entire glorious splendor. To find the trailhead in Hope, turn north off Highway 200 onto Centennial Avenue next to the Memorial Community Center. Take a left onto the old highway and go about one-quarter mile to the post office. Main Street, a narrow, one-lane paved road, veers right uphill in front of the Post Office. Follow it a couple of hundred yards and take a sharp right uphill toward the cemetery; continue past the cemetery on a dirt road beyond the sign that says “Road Closed 3/4 Mile Ahead” to the trailhead.